Policemen in Japan have always been there, on the street corners and in the neighborhood, helping out people, keeping order, giving directions. It's good to know that is still the case. This is one of many taken by protesters and independent media on Friday, June 15, 2012. For more videos of the event, go to this blog. Japan Times: "Oi decision draws international outcry"
OSAKA — The decision to restart two reactors at the Oi nuclear plant has sparked international concern, with antinuclear activists and politicians in many countries sending letters of protest and holding rallies outside Japanese embassies and consulates over the past week. Politicians from green parties in Australia and Europe, as well as doctors, activists, and labor unions, have all formally opposed the restart, citing the Fukushima disaster. In Germany, all 53 members of the green party sent a letter of protest Tuesday to Prime Minister Yoshihiko Noda and Fukui Gov. Issei Nishikawa via the Japanese Embassy. Also in Berlin, Rebecca Harms, a German Green and member of the European Parliament, sent a letter on behalf of European Green Party members calling for a halt to the restart. In Australia, meanwhile, Sen. Scott Ludlam of the Australian Greens sent a letter of protest June 12 to Japan's Embassy in Canberra. In Italy, an appeal for a moratorium on restarting nuclear power plants bearing 3,700 signatures was presented to the Japanese Embassy in Rome, while antinuclear activists in New York delivered letters opposing the restart to the city's Japanese Consulate on Friday. A separate rally to protest the decision is planned in front of Japan's Embassy in Washington on Monday. Other antinuclear groups in Chicago and Los Angeles will hold similar events this week and also deliver letters opposing the Oi restart to local Japanese consulates. In Asia, antinuclear activists in Thailand held a rally in front of the Japanese Embassy on Friday and urged Tokyo to rethink its decision, while Japanese residents in South Korea joined local activists for a demonstration in front of Japan's Embassy in Seoul, also Friday. "Shame on you, Mr. Noda"
Personally, I agree that the prime minister deserves the rebuke like that, but I find it hard to believe that the official letter from an established political party in Germany submitted to the Japanese embassy in Berlin would start out with "Shame on you". But I could be wrong. If German readers of this blog can find the original statement, please let me know. They must be feeling safe to report, because the scale of the protest was much smaller in the morning of June 16. 300 to 400 people showed up in the rain to protest the ministerial meeting that PM Noda was having at that time. The Japanese mainstream media show no embarrassment for not having reported anything at all on the June 15 protest of 11,000 people. None of them even say there was a protest on June 15.
Who are they kidding? Majority of Japanese people whose sources of news are still traditional newspapers and TV, and/or who would rather not hear anything combative like a protest against a government policy. ...But the decision risks a backlash from a public deeply concerned about nuclear safety. As many as 10,000 demonstrators gathered outside Noda's office on Friday night amid a heavy police presence to denounce the restarts, urging the premier to step down and shouting "Lives matter more than the economy." I heard that BBC also reported in the news program, but I haven't found it myself. (UPDATE) New York Times joins the Japanese colleagues by only mentioning June 16 protest. See my post. To the Economist reporter who wrote this, the politics in Japan today is the same as how it has existed for near-eternity - nothing but backroom bargaining between the ruling party and the opposition, occasionally enlivened by a vocal upstart (like the boy-wonder mayor of Osaka City), with the ignorant mass nervously looking in from outside to see what lot the power that be may have in store for them. UNLIKE Japan’s half-dozen recent prime ministers, many of whom were privileged offspring of earlier statesmen born for high office, Yoshihiko Noda last year came into the post unexpectedly. Despite that, and though his term may be no longer than theirs, Mr Noda is showing unexpected leadership. He may accomplish more than his recent predecessors combined. His aim is to set an ageing, shrinking society back on course, after it was shaken by the disasters of last year. He is guided by the conviction that he must salvage the public finances, by doubling the consumption (sales) tax to 10%. The problem is that his Democratic Party of Japan (DPJ) promised, during the election campaign that led to it overturning five decades of rule by the Liberal Democratic Party (LDP) in 2009, not to raise taxes. Mr Noda is seen as a traitor by those who stand by the campaign promises. Worse, Mr Noda has courted powerful bureaucrats and the LDP-led opposition that controls the upper house of the Diet (parliament). In other words, he governs as LDP prime ministers used to. People in both camps find that hard to take. But most in the LDP know that the public would treat their party with even greater disdain if it now opposed a tax it was the first to promote. Both camps also fear the maverick mayor of Osaka, Toru Hashimoto, who is contemplating the launch of a national anti-establishment movement. In effect, he is pushing the LDP into bed with Mr Noda. The opposition and government now seem set to do a deal to raise the tax in stages in 2014 and 2015. Then, in a Diet session extended by perhaps a month, they will try to decide how to spend the ¥13.5 trillion ($175 billion) it will raise each year. Under LDP pressure, Mr Noda is also backtracking from the more unworkable campaign promises on pensions, child care and help for the poor. The prime minister is also staking his reputation on a second belief, that Japan needs to restart some of its nuclear reactors to prevent the economy being crippled by energy shortages. (All 54 of them were shut down, at a time of high anti-nuclear feeling, following the Fukushima disaster.) Here, too, Mr Noda is co-operating with the LDP: an independent nuclear regulator is likely to be proposed soon. That will give him some cover to announce the restarting of the Oi nuclear plant in Fukui prefecture, which powers the Kansai industrial region of which Osaka is the heart. But what happens after that? Mr Noda seems safe from internal opposition for the moment. His chief foe within the party is Ichiro Ozawa, who has cast a longer political shadow over the past two decades than anyone. But Mr Ozawa’s fortunes fell this week when it emerged that his wife had written to his closest supporters about his two mistresses and his illegitimate child but, more crucially, had berated her husband for taking months to visit the disaster-affected areas of Iwate, his home prefecture. The public standing of the prime minister’s other foe, Mr Hashimoto, may have also peaked. The combative mayor is now having to make compromises that undermine his outsider status. He is backing away from a fervently anti-nuclear stance and he needs to mollify politicians in Tokyo to get their backing for sweeping administrative changes in Osaka. Local spending cuts are also harming his popularity. Back in Tokyo, some members of the opposition think that they can do business right through till next summer with the best prime minister the LDP never had. In effect, a kind of “grand coalition”, long favoured by the elites but always rejected by voters, would be at work. Mr Noda may prefer to see his twin aims passed into law and then call a snap election. On current form, he would lose. But it is when Mr Noda seems to care least about his own survival—and perhaps his party’s—that he is most effective. Good Morning. The entrance hall of the PM Official Residence is packed with reporters even though today is Saturday. Outside the Residence is full of people demonstrating despite the rain. The meeting to decide on the restart of Ooi Nuclear Power Plant is about to begin. Why don't you report just that on your paper and on your TV, Asahi? What do you think of Mr. Yamamoto? Don't you think he is deserting under enemy fire? Why don't you instead report on this protest, as it is happening? I cannot write about it, I am just a reporter. Isn't it because writing about it is against the editorial policy of your magazine? Others suggested that the reporter, critical of people escaping the radiation, should volunteer to work inside the Containment Vessels at Fukushima I Nuclear Power Plant to see how unafraid he is. Any insight on the possible or likely outcome, European readers? Greek political leaders made their final campaign pleas before elections tomorrow that may determine whether the country becomes the first member of the euro to leave the currency union. “The first thing we must determine in the elections on June 17 is to choose between the euro or drachma,” New Democracy leader Antonis Samaras told a crowd of flag-waving supporters in central Syntagma square last night. He faced the Parliament building in Athens, the site of protests against austerity measures demanded in return for 240 billion euros ($303 billion) of emergency aid pledges. A vote for the anti- bailout Syriza party “means Greece out of the euro,” he said. The vote will turn on whether Greeks, in a fifth year of recession, accept open-ended austerity to stay in the euro or reject the bailout conditions and risk the turmoil of exiting the 17-nation currency. World leaders, who gather for a summit in Mexico June 18, have said they’d prefer a pro-euro result, underscoring concern over global repercussions. Almost 10 million Greeks are eligible to vote for the second time in six weeks after a May 6 ballot failed to yield a government. Exit polls will be released when voting ends at 7 p.m. in Athens, with a first official result estimate due around 9:30 p.m. The final polls, published on June 1, showed no party set to win a majority. Syriza leader Alexis Tsipras, who promises to renege on Greece’s end of the bailout deal, and New Democracy ran even in final opinion polls. The socialist Pasok party, which won the 2009 election and led the country into the bailout, was third at about 13 percent. Tsipras told Athenians June 14 that he was sending a message that nobody should bet on Greece leaving the euro area. “Turn your backs on the two parties of bankruptcy,” Tsipras told supporters, referring to the Pasok and New Democracy parties which co-signed the rescue. They “lowered the Greek flag and surrendered it to Angela Merkel”-- the German chancellor who led the demand for austerity -- he said. With the rumor (or was it an announcement? or does it matter?) that the world's central banks (ECB, FED, BOJ, etc.) will intervene in case of a dire credit crunch that may happen depending on the result of the 2nd Greek election this Sunday, there seems to be nothing to lose for the Greeks to vote out the incumbent parties. Judging by how the stock markets around the world fared toward the end of this week (particularly that of the US), the central bank intervention is very much priced in. It's just amazing. A quick check of the Japanese and English media shows ZERO coverage of the largest protest so far (11,000 people) against Ooi Nuclear Power Plant right in front of the Prime Minister's Official Residence in central Tokyo. ZERO. Not even Tokyo Shinbun. In the meantime, the Noda administration has determined that "a certain understanding" among the Japanese citizens has been achieved regarding the restart of the plant, according to Jiji Tsushin. Issei Nishikawa, Governor of Fukui Prefecture, will meet with Prime Minister Yoshihiko Noda and others in the morning of June 16, and will express his intent to agree to the restart of Reactors 3 and 4 of KEPCO's Ooi Nuclear Power Plant (in Ooi-cho, Fukui). Then the government will hold a ministerial meeting of the prime minister and 3 other ministers including Yukio Edano, Minister of Economy, Trade and Industry to officially decide to restart the plant, now that a certain understanding of the citizens has been obtained. It will be the first time for any of the nuclear reactors that have stopped due to the regular maintenance after the Fukushima I Nuclear Power Plant accident in March last year to resume power generation. [On receiving the official word from the government,] KEPCO will immediately start preparing for the restart, and Reactor 3 of Ooi Nuclear Power Plant will be the first to restart in early July. Since early May, no commercial nuclear reactor has been in operation in Japan. Net citizens in Japan, nonetheless, are on to the next campaign. They are calling the MSMs and demanding that they report on the anti-restart protests. so reports Tokyo Brown Tabby, in the cat's very first participation in any demonstration. 10,000 may not seem big to the US or European readers. But in the Japanese context, it is simply unprecedented to have that many people in the middle of the largest metropolis in Japan in protest against the national government policy (restart of Ooi Nuclear Power Plant in Fukui). TBT and others who joined the crowd say they were just ordinary people - mothers and fathers with children, salarymen and OLs on the way home from work, etc. Independent journalist Yasumi Iwakami tweets it was 11,000 people in front of the PM's Official Residence in Tokyo. His outfit, IWJ, netcasted the event and the one in Osaka in front of KEPCO headquarters live. In contrast, the Japanese MSMs told the viewers about everything but the protests against the restart - Aum Shinrikyo member arrest was the top news. By now, even the ordinary Japanese have caught up with their antics. NHK Kabun (culture and science division) tweets "It's 41 days since all nuclear power plants in Japan stopped." People reply to this tweet by saying, "And you continue to ignore the protest in front of the PM Official Residence against the restart." It will start in about 45 minutes (at 6PM). Tokyo Brown Tabby just sent me a note on the way to the Prime Minister's Official Residence in central Tokyo. Tabby's blog will be updated from the cellphone. If you read Japanese, the blog is here. Meanwhile, the official ceremony to restart Ooi Nuclear Power Plant for the sake of the Japanese citizens (whose voices don't count unless it is in elections) continues. Jiji Tsushin reports that the governor of Fukui met with the president of KEPCO the plant operator, and the governor was very satisfied with the KEPCO president's "determination to try to make the safe operation the first priority" (安全運転を最優先するよう努める). KEPCO says it will try, and the governor is impressed. Governor Nishikawa will meet with Prime Minister Noda in the morning of June 16, and the restart will be formally decided after the prime minister confer with his three ministers. Dr. Satoshi Mori, professor emeritus at Tokyo University (Faculty of Agriculture), has the photographs of male and female flowers of a cedar tree that he collected this year in Hitachinaka City in Ibaraki Prefecture. The city is located at about 120 kilometers from Fukushima I Nuclear Power Plant. Cedar is simultaneously monoecious - i.e. bearing separate flowers of both sexes at the same time. Professor Mori explains that some branches bear only male flowers while others bear only female flowers. But what he found in the cedar tree in Hitachinaka City was asymmetrical, malformed branches with both male and female flowers. Professor Mori suspects that the growing point of the cedar tree was irradiated, and that resulted in the developmental anomalies you see in these photos. He says more samples are needed to definitely conclude the anomalies are the result of irradiation. Professor Mori has been studying the effect of radiation from the Fukushima accident on wild life by actually going to the affected, high-radiation areas including Iitate-mura in Fukushima and collecting samples - spiders, earthworms, dragon flies, cedars, etc. For more of his observations that I have covered, see these posts. Mr. Takeshi Fujimaki, CEO of Fujimaki Japan, was one of the top traders at J.P. Morgan worldwide for over a decade, earning the moniker "legendary trader" from the chairman of J.P.Morgan (according to wiki). He was also an advisor to George Soros. He has some extremely dire predictions for Japan, much more so than those by Kyle Bass. 10-year bond yield may shoot up above 80%. In other words, he says Japan may become "Greece". What is he doing to hedge the risk? He says he's buying US dollars. Investors should buy assets in U.S. dollars and other currencies of strong developed nations because Japan may default within five years, said Takeshi Fujimaki, former adviser to billionaire investor George Soros. “Japan is likely to default before Europe does, which could be in the next five years,” the president of Fujimaki Japan, an investment advising company in Tokyo, said in an interview yesterday. Japanese should hold foreign-currency products, such as those denominated in the greenback, Swiss franc, sterling, Australian and Canadian dollars, Fujimaki said. Should the Japanese government default, the yen may weaken to 400-500 per dollar, and the yields on benchmark 10-year bonds could surge above 80 percent, according to Fujimaki. “I’m buying dollars in case of an emergency,” he said. The yen fell 0.2 percent to 79.48 per dollar as of 9:14 a.m. in Tokyo from its close in New York yesterday. The currency touched the post war high of 75.35 per dollar on Oct. 31 and has averaged about 103 over the past decade. Japan’s 10-year yields were little changed yesterday at 0.86 percent. Rates on June 4 dropped to 0.79 percent, the lowest since June 2003. Five-year credit-default swaps that insure Japan’s debt from nonpayment were at 90.9 basis points yesterday, up from a seven-month low of 90.1 on March 27, according to CME Group Inc.’s CMA. The contracts pay the buyer face value in exchange for the underlying securities if a borrower fails to meet its debt agreements. A drop signals improving perceptions of creditworthiness, while an increase suggests the opposite. Japan’s public borrowings, the world’s biggest, will balloon to 245.6 percent of its annual economic output in 2014, up from 67.3 percent in 1984, an estimate by the International Monetary Fund shows. Japanese Prime Minister Yoshihiko Noda is struggling to gather support for his plan to double the 5 percent sales tax by 2015 to help reduce debt. Greeks vote in a general election on June 17 after balloting in May failed to produce a coalition government. The result may determine whether Greece abides by spending reductions imposed upon it to receive two international bailouts and stay in the euro. The euro currency bloc may break up in the next 5 to 10 years, Fujimaki said. There are many, both in Japan and outside, who say "Japanese sovereign debt is not like that of Greece, or the US, because the debt is almost all held in Japan by the Japanese". Well, that's precisely the problem. Japan's financial institutions have been investing the deposit money in the Japanese government bonds (JGBs). In the case of Japan Post Bank, 80% of the deposit money is invested in JGBs. Life insurance companies used to lend out more than 50% of the money from the insurance premiums collected from the policy holders; now, it's only 13%, and the rest of the money goes to the JGBs. Ratio of loan to deposit at private banks was 98% 10 years ago; now it is only 73% and the difference has gone to the JGBs. If the Japanese government defaults and the JGBs become worthless, there will be no deposits, no pensions, no insurance payout, he says. He also cites the example of wartime bonds issued during the World War II in Japan. The ownership of the bonds was 100% Japanese, but that didn't prevent the bonds from becoming worthless in the post-war inflation. For the rest of the videos, go to TEPCO's website, here. Videos posted in my latest post, here. In the previous survey, Quince didn't enter this particular area of extremely high radiation. The farcical official ceremony to restart a nuclear power plant that does not have an earthquake-proof building like Fukushima I Nuke Plant and which possibly sits on top of an active fault or two on the coast of Fukui Prefecture continues, in complete disregard for the "small people". Fukui Prefectural Assembly met on June 14, and the whole assembly (except for the Japan Communist Party members and unaffiliated members) deferred to the governor of Fukui Issei Nishikawa to make the final decision of the restart. Ooi-cho's Mayor Shinobu Tokioka agreed to the restart, and cited 5 (non-)reasons why he was in favor of the restart to the municipal assembly. They were 1) Prime Mnister Noda made a speech to the citizens of Japan about the necessity of the Ooi restart; 2) Experts in the prefecture said it would be safe; 3) There would be a special surveillance system; 4) The Ooi-cho assembly had agreed to the restart; 5) His town had a responsibility to provide electricity to Kansai Region. The governor of Fukui will ceremoniously confer with the mayor of Ooi-cho, to confirm the mayor's intention of the plant restart. The governor will then seek further assurance for safety from KEPCO. KEPCO will tell the governor the plant will be safe. The governor will tell the national government that he will agree to the restart. So the grand finale will be on Friday, June 15, right before Noda departs for Mexico for the G20 meeting, whether the residents of Japan like it or not. As a gesture to further placate the unreasonable citizenry who demand no nuclear plant restart, the Diet will pass a legislation, also on June 15, which was concocted behind the closed door by the non-official officials of the leading parties (DPJ, LDP and Komei Party). The legislation will create a new government council on nuclear disaster prevention whose members will include all the cabinet ministers. DPJ, LDP, Komei agreed on the legislation on nuclear regulatory organizations that would newly create "Nuclear Disaster Prevention Council"
On June 14, DPJ, LDP, Komei came to the final agreement on the legislation to create the new organizations in charge of nuclear safety. As the nuclear disaster prevention organization in peacetime, "Nuclear Disaster Prevention Council" will be newly created, with the prime minister at its head and made up of all the cabinet ministers. Now that the parties have agreed, it will be proposed as "legislation by Diet members" and is expected to pass the Lower House on June 15. Creation of the Council was discussed and agreed on by DPJ's Yoshito Sengoku (Acting chairman of the Policy Research Council), LDP's Yoshimasa Hayashi (Acting chairman of the Policy Research Council), and Komei's Tetsuo Saito (Acting Chief Secretary) inside the Diet building on June 14. Ummm. The government had a similar committee already at the time of the Fukushima I Nuke Plant accident. It miserably failed. So what do the true-blue politicians do? Do it again of course. Maybe the next time will be different! If you are in Tokyo or Osaka on June 15, you can join the demonstrations at the Prime Minister's Official Residence (Tokyo) or KEPCO's headquarters (Osaka City) at 6PM. For more, see my previous post. Nigel Farage: "Euro Titanic Hit the Iceberg and There Aren't Enough Lifeboats"
In an epic rant, trumping Biderman, UKIP's Nigel Farage appears to have reached the limit of his frustration with his 'peers' in the European Parliament after the Spanish bailout. Rajoy's proclamation that this bailout shows what a success the euro-zone has been, sends Farage over the edge as he sees the Spaniard as just about the most incompetent leader in the whole of Europe (up there with favorites like Van Rompuy and Barroso). The erudite Englishman notes that by any objective criteria "The Euro Has Failed" expanding on the insane farce of Italy funding Spain's banking bailout at a loss (borrowing at 6% to fund a loan at 3% as we discussed here). "This 'genius' deal makes things worse not better" as it merely drives other nations towards needing bailouts themselves and while his socialist colleagues in the room are mumbling and checking their blackberries, he reminds them that Spanish national debt will surge and that 100 billion does not solve the problem, and that if Greece leaves, the ECB is failed, is gone, and to rectify this there will be a cash call from the very same PIIS (Ex-G) that are tumbling towards the abyss. Blood pressure surges as he screams "you couldn't make this up" concluding that "the Euro Titanic has now hit the Iceberg and sadly there simply aren't enough lifeboats." Mainichi Shinbun (6/13/2012) reports 130 residents in Fukui Prefecture (where Ooi Nuclear Power Plant is located) and the neighboring Shiga Prefecture have filed a lawsuit against the national government, demanding that the government order Kansai Electric to not restart the Reactors 3 and 4. Kyodo News has just reported that the mayor of Ooi-cho has agreed to the restart. Toru Hashimoto, the boy-wonder mayor of Osaka City who meekly turned pro-restart, dutifully praises the mayor of Ooi-cho, Jiji Tsushin reports (6/14/2012). "I appreciate it very much", the mayor said to the press. He also insisted that the restart be "provisional", that the plant operate only during the summer peak months. No way that's going to happen. Besides, that would expose plant maintenance workers to unnecessary, added radiation exposure just to please Hashimoto. Quince No.2 did not find visible damage to the building interior, but got 505.6 millisieverts of radiation exposure for the 4-hour work. Earlier, human workers went down to the Torus Room of Reactor 2 trying to photograph the level of water inside the Suppression Chamber with an infrared camera to estimate the location of the leak. They were unsuccessful, probably due to steam on the surface of the water. Reactor 2 is more scary to me than Reactor 3 or Reactor 4. No visible damage anywhere, yet it has released the most radioactive materials. Thermocouples keep failing, and such a high radiation out of nowhere. TEPCO announced on June 13 that it conducted the survey of the interior of the Reactor 2 building using a robot, which measured the 880 millisieverts/hour radiation near the concrete floor on the 5th floor right above the reactor. The 5-year cumulative maximum radiation exposure for nuclear workers (100 millisieverts) would be reached in about 7 minutes at that location. TEPCO thinks it will be difficult for [human] workers to enter the 5th floor. According to the company, there was no visible damage to the interior of the building. The improved version of "Quince", robot developed in Japan for disaster response support, went up to the 5th floor and measured the radiation. The concrete floor with the highest radiation level this time is about 2-meter thick, and about 3.5 meter away from the top of the Containment Vessel. The robot got 505.6 millisieverts of radiation exposure in the 4-hour survey, and the 9 [human] workers got the max 3.95 millisieverts. There is no data yet on TEPCO's sites (English or Japanese). I'll post when they do. And so, the little rating agency that could, just gave Spain the triple hooks, downgrading the country from B to CCC+, negative outlook. As a reminder, the Uganda credit rating is B: it sure is no Spain. Synopsis: KINGDOM OF SPAIN EJR Sen Rating(Curr/Prj) CCC+/ CC Rating Analysis - 6/13/12 EJR CP Rating: C Debt: EUR805.9B EJR's 1 yr. Default Probability: 18.0% Spain continues to be weakened by high funding costs (6.75% for 10yr today), the gov. deficit of 9.6%, an estimated decline in GDP of 1.7% (per the Economy Ministry), the 24.4% unemployment, the IIF's recent estimate of additional bank loan losses up to EUR260B, and possible depositor withdrawals. Over the past four fiscal years, that is from 2008 to 2011, Spain's GDP declined from EUR1.09 trillion to EUR1.07 trillion. Meanwhile, its debt mushroomed from EUR519B to EUR806B. With the EUR100B infusion for Spain's banks, the debt to GDP will rise to 90% plus future additions for the government deficit, support for its regions and additional support for its banks. Social benefits are a major problem; while payments to the govt have been down EUR 3B (2008 to 2011), payments from the government have been up EUR 29B). As a result, Spain is short about EUR50B per year for social payments, EUR35+B per year for interest, and an additional EUR 30B for asset growth; hence the EUR110+B per annum increase in debt. As we expected, Spain requested support for its banking sector and will probably need cash for weaker provinces. Assets of Spain's largest two banks exceed its GDP. We are slipping our rating to " CCC+ " ; watch for more requests for support from the banks and money creation. ...New Democracy has been telling voters they must choose between the euro or the drachma, while Syriza promises to end the austerity measures imposed by Greece's international lenders, such as salary and pension cuts, that have driven many Greeks into abject poverty. Fears that Greece will collapse financially and leave the euro have slowly drained Greek banks over the last two years. Central bank figures show that deposits shrank by about 17 percent, or 35.4 billion euros ($44.4 billion) in 2011 and stood 165.9 billion euros ($208.1 billion) at end-April. Bankers said the pace was picking up ahead of the vote, with combined daily deposit outflows from the major banks at 500-800 million euros ($625 million to $1 billion) over the past few days, and 10-30 million euros ($12-36 million) at smaller banks. "This includes cash withdrawals, wire transfers and investments into money market funds, German Bonds, U.S. Treasuries and EIB bonds," said one banker, who spoke on condition of anonymity. Retailers said consumers were stocking up on non-perishable food while almost all other goods were seeing a huge drop in sales as cash-strapped Greeks have no money to spare in the country's fifth year of recession. "It's over the top, we must not panic. Filling the cupboard with food doesn't mean we will escape the crisis," he said. TEPCO's live cam of Fukushima I Nuclear Power Plant is set up near the Seismic Isolation Building near the Reactor 1 building, looking toward the Reactor 4 building and the Common Spent Fuel Pool (i.e. looking southeast). 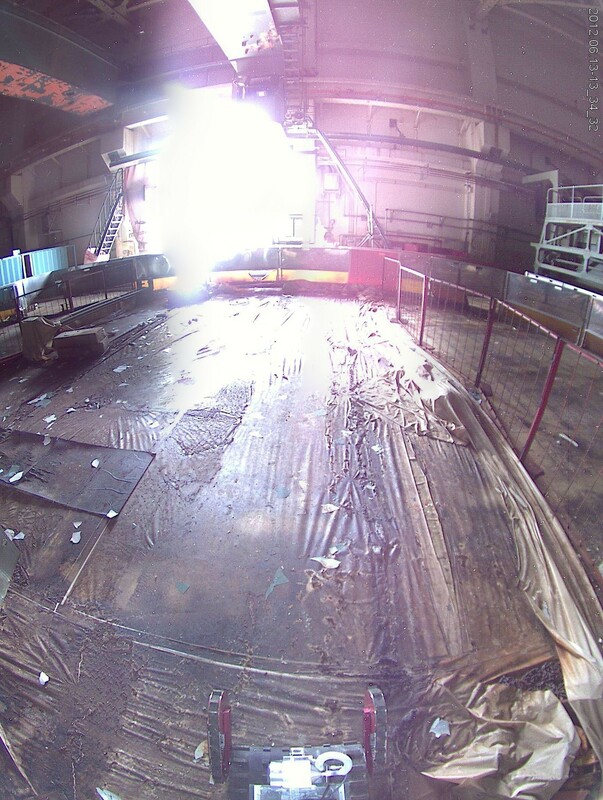 In fact, there is a camera right now from the Reactor 4 side. There is a camera on the upper part of the [exhaust] stack on the south side of Reactor 4, and we've been looking [at the images from that camera]. His tweet is in response to a comment about a talk of moving the live cam to a different location, possibly to the Reactor 4 side. The worker also alleges that the fabric cover over the Reactor 1 building is only cosmetic, and nothing to do with preventing the radioactive materials from escaping. There was a talk, presumably from the contractors, to build a more permanent structure (more like the one they are building for Reactor 4) but that was shot down by TEPCO over the cost concerns. They wanted the badly damaged Reactor 1 building out of sight of the live cam, he says. It means, "So what's the point of saying?" Replace the word "autumnal" with "perpetual" and that's been Japan since March 2011. The latest idiocy comes from a village in Gunma Prefecture where many have pointed out that the radiation levels are rather high. Villagers "decontaminated" the public places in the village by removing the contaminated soil. What then did the village do with the contaminated soil? They used it in the soccer field. Soil removed by decontamination work was used in the soccer field, and Kawaba-mura says "No problem"
It was revealed during the June 12 meeting of the [Gunma] prefectural assembly special committee on radiation countermeasures that the soil contaminated with radioactive cesium that had been removed by the volunteers in Kawaba-mura was used as filling to raise the ground level of the soccer field that the village was building. According to the survey done by the prefectural government last summer, 1,300 becquerels/kg of radioactive cesium was detected, which was below the national standard for burying safely in the landfill (8,000 becquerels/kg). Since the soccer field was completed, the [air] radiation levels on the perimeter of the field have been low. The village says, "There is no problem of safety." According to Gunma Prefecture and the village, volunteers in the village removed about 40 tonnes of surface soil in August last year from 4 locations in the village that were found with relatively high levels of air radiation, including the schoolyard of Kawaba Elementary School. The village was temporarily storing the removed soil on the land owned by the village. However, after the residents living nearby complained, the village buried the soil about 50 centimeter deep in the soccer field it was building in September. Kawaba-mura's official radiation levels are between 0.1 to 0.5 microsievert/hour. People who actually went there and measure various locations in the village report much higher numbers. Professor Yukio Hayakawa considers Kawaba-mura as one of the hot spots in Kanto Region. Setagaya-ku in Tokyo continues to send school children to the "summer school" in Kawaba-mura. At 8:28PM on June 12, 2012, he was finally released from the pain from his terminal gallbladder cancer. He had just turned 49 the previous day. I do not know him personally, but he was one of the several independent journalists I started to recognize in the early days of the Fukushima I Nuclear Power Plant accident when he was a fixture at TEPCO's press conferences. In May last year, he was diagnosed with the terminal case of gallbladder cancer and was told he had 6 months to live. If anything, that spurred more activities from him. He continued to attend the press conferences, and co-authored a book with another independent journalist (Ryuichi Kino) who was (still is) a fixture at TEPCO's pressers titled "検証 福島原発事故・記者会見――東電・政府は何を隠したのか (Investigation: Fukushima Nuckear Power Plant Accident Press Conferences - What did TEPCO and the government hide)". The book was published in January this year. After the start of the Fukushima I Nuclear Plant accident, Kazuo Hizumi attended the TEPCO's press conferences every single day, questioning TEPCO and the government officials who tried to minimize the accident. As both a lawyer and journalist, Hizumi's questioning was sharp, pressing TEPCO and the government to disclose information that directly affected ordinary citizens, such as the discharge of contaminated water and low-level radiation exposure. That's how I remember hearing him in the TEPCO press conferences that I watched via the net on USTREAM, thanks to another independent journalist Yasumi Iwakami. On June 7, 2012, about 70 women including 10 women from Fukushima did a "die-in" in front of the Prime Minister's Official Residence to protest against the restart of Ooi Nuclear Power Plant. Before the die-in, 10 Fukushima women visited the Cabinet Office and met with officials to submit a letter of requests addressed to Prime Minister Yoshihiko Noda. Net citizens in Japan are planning for large demonstrations in front of the Prime Minister's Official Residence in Tokyo and in front of the Kansai Electric Power Company (KEPCO) headquarters in Osaka on Friday June 15, 2012. Last Friday, 4,000 people of all walks of life gathered in front of the Prime Minister's Official Residence to protest the then-ongoing press conference by Noda in which he said he would restart Ooi Nuke Plant to "protect the people's living". The organizers are hoping to have 10,000 people or larger this Friday. I've been asked if I could spread the information to the foreign residents in Japan by writing a post, so here it is. Probably by Friday, PM Noda is expected to make his final decision (foregone conclusion, as we all know). And then he's off to Mexico, I hear, to attend G20 meeting. You can also view the translation of @twitnonukes webpage at this blog. Professor Hayakawa woke up on Monday June 11 and decided to drive to Namie-machi and Iitate-mura in Fukushima Prefecture with his personal survey meter and two pieces of bread for lunch. I noticed he was up somewhere in Fukushima when I saw his tweet yesterday with his survey meter showing 8.157 microsieverts/hour with a school building in the background. "Tsushima Elementary School", he wrote. It did turn out to be the school in Tsushima District of Namie-machi. Hayakawa says in his series of tweets that it took him 14 hours round-trip from Saitama Prefecture, from 6 in the morning to 8 at night. 20-kilometer radius no-entry zone doesn't mean a thing in reality. Three policemen at the gate [checkpoint] were like "What '20 kilometer'?" 20-kilometer [location] on Route 114 is at a power plant [not Fuku-I, but Hirusone hydroelectric plant], but the gate is at the Tsushima Nursery School, at about 28 kilometers. So I couldn't go to Akougi [the location that exceeded 300 microsieverts/hour on March 15 last year]. It was clear by being there that, both in name and in substance, it was decidedly not the local mayors who set the 20-kilometer radius no-entry zone. The laws and regulations have little to do with the reality, and that's been going on for 13 months now. This is no good. No good at all. The policeman standing at the gate near the Tsushima Nursery School looked to be in his 20s. His superior said he was from Hokkaido, so the young policeman must be also from there. To have such a young person standing on such a location [high radiation], what a cruel country this is. I was still wandering about in Tsushima when a police car came up and questioned me. They wanted to see my driver's license so I showed it to them obediently. The two policemen were from the Metropolitan Police Department (Tokyo). They said they were on the 2-week tour of duty, and were staying at Iizaka Onsen [hot spring resort near Fukushima City]. They knew about the high radiation [at that location] qualitatively, but didn't seem to have a quantitative understanding. On my way out, I said to them, "The radiation levels are high here, so please take care." Out of the blue, their commander said, "Slander and calumny!" I was taken aback. I figured they had been told [about the high radiation levels] many, many times. The commander came out from a roadside building. He seemed to spend most of his day in a relatively low-radiation environment [i.e. inside the building]. The young policemen were wearing 99 masks [masks that can cut 99% of particles as small as 0.1 micron in diameter ]. The commander wasn't. Following the footsteps of the students from Middle Tennessee State University, 1,000 high school students from across the United States will be volunteering in the disaster affected Tohoku, in Fukushima, Miyagi, Iwate, and Ibaraki Prefectures. Activities will include clean-up and planting trees, according to the Japanese government foundation who invited them. Around 1,000 high school students and youths from the United States will visit the Tohoku region in three groups from Sunday to carry out volunteer work in four disaster-hit prefectures at the invitation of the Japan Foundation. Each group will stay in the country for a fortnight and engage in various exchanges with locals in Iwate, Miyagi, Fukushima and Ibaraki prefectures, according to the foundation, which specializes in cultural exchanges. Participants in the program will come from 40 schools across the United States, including areas affected by natural disasters in the past, including Hurricane Katrina in 2005. The last group will arrive in late July. Some of the students are from the former schools of two young American teachers killed by the March 2011 tsunami — Taylor Anderson from Virginia and Montgomery Dickson from Alaska — who were teaching English at schools in Ishinomaki, Miyagi Prefecture, and Rikuzentakata in Iwate. Those students will visit both cities, which were devastated by the Great East Japan Earthquake. All those taking part will also visit Kobe to witness the city's recovery from the 1995 Great Hanshin Earthquake. The above Japan Times article doesn't say much about the students' activities beyond "cultural exchanges", but the Foundation's press release does. Kyodo News (Japanese) had a PR press release from the Japan Foundation, a government corporation under the Ministry of Foreign Affairs, in April this year announcing the event. According to the PR release the project is called "Kizuna strengthening project". The high school students from all over the US will visit Miyagi, Iwate, Fukushima, Ibaraki, and stay for 2 weeks and do volunteer works (cleaning, planting trees, etc.) and mix with local residents in various activities to experience how the recovery is taking place. The first batch of students will stay in the region from June 10 to 23, the second batch from July 1 to 14, and the third (and the last) one from July 8 and 21. The Foundation and the ministry behind the Foundation are hoping that these young impressionable students will return to the US and start disseminating the positive, happy images of Japan's wonderful recovery from the earthquake and tsunami disaster of March 11, 2011 to "counter baseless rumors and further the understanding of the situation in Japan by the US citizens" (my translation, from their PR piece). I almost forgot - this "Kizuna strengthening project" will invite the total 10,000 high school and college students from the US and Asia-Pacific region over 1 year period. For your information, the original meaning of "kizuna" in Japanese is a "rope that ties down the legs of a horse so that it cannot escape". Some say it is to tie down a cow. * We [the national government] wants Fukui Prefecture to cooperate, with its over 40 years of experience and ability to face nuclear safety. Connected through the teleconference system at all time, constantly monitor the restart, and provide information to the citizens. In case of an emergency, immediately grasp and analyze the situation, and decide on the necessary countermeasures. In case of a nuclear emergency, the Senior Vice Minister will act as the local head of the emergency headquarters, and implement measures to respond to the plant accident. So they will solely rely on the plant manufacturers (the only ones who know anything). The teleconference system will be on all the time, connecting the plant, the Off-Site Center, KEPCO, and NISA. In case of an emergency, the Prime Minister's Official Residence and the plant will be connected. Now, you can laugh and be merry. It's good for you, remember? There may be little to no worry about radiation (other than natural background), but the floating dock from Misawa Port in Aomori Prefecture in Japan that washed up on the Oregon coast had 1.5 tonnes of marine life that had hitched the 5,000-mile ride. Half of the plant species on the dock already exist on the west coast, according to the AP article below, meaning the remainder don't and may be "invasive species". When a floating dock the size of a boxcar washed up on a sandy beach in Oregon, beachcombers got excited because it was the largest piece of debris from last year's tsunami in Japan to show up on the West Coast. But scientists worried it represented a whole new way for invasive species of seaweed, crabs and other marine organisms to break the earth's natural barriers and further muck up the West Coast's marine environments. And more invasive species could be hitching rides on tsunami debris expected to arrive in the weeks and months to come. "We know extinctions occur with invasions," said John Chapman, assistant professor of fisheries and invasive species specialist at Oregon State University's Hatfield Marine Science Center. "This is like arrows shot into the dark. Some of them could hit a mark." Now, hotspots like San Francisco Bay amount to a "global zoo" of invasive species and perhaps 500 plants and animals from foreign shores have established in U.S. marine waters, said James Carlton, professor of marine sciences at Williams College. They come mostly from ship hulls and the water ships take on as ballast, but also get dumped into bays from home aquariums. The costs quickly mount into the untold billions of dollars. Mitten crabs from China eat baby Dungeness crabs that are one of the region's top commercial fisheries. Spartina, a ropey seaweed from Europe, chokes commercial oyster beds. Shellfish plug the cooling water intakes of power plants. Kelps and tiny shrimp-like creatures change the food web that fish, marine mammals and even humans depend on. "It may only introduce one thing," said Cohen of the Aquatic Bioinvasions research center. "But if that thing turns out to be a big problem, we would rather it not happen. There could be an economic impact, an ecological impact, or even a human health impact." "That's the 'Johnny Clamseed' approach," he said, referring to Johnny Appleseed, the pioneer apple tree planter of the early 19th century. "While that is theoretical, we don't actually know if that kind of thing happens." The smaller bits of plastic expected to make up most of the tsunami debris won't have anything except species they picked up at sea, said Carlton. Whether hitchhiking species will survive here depends on randomness, she said. Seaweeds probably would not have survived to reproduce in the crashing surf at Agate Beach. It's the wrong kind of environment. But if they had floated into Yaquina Bay, very similar to their home waters in Japan, they could grow and reproduce. Lindeberg said, "The only defense for invasive species is early detection. Just like cancer." "It goes to show you that when it comes to invasive species, there are some things you can work to regulate and control," he said. "And there are issues like this that come up that open up a whole different realm of possibilities."